Great PM is the person who tries setup the processes in the way that he/she will be as less required and as less involved in the project as possible. Ninety-nine times out of a hundred, people don’t criticize themselves for anything, no matter how wrong it may be. Criticism is futile because it puts us on the defensive and usually makes us strive to justify ourselves. Criticism is dangerous, because it wounds our pride, hurts our sense of importance, and arouses resentment. Don’t criticize others; they are just what we would be under similar circumstances. We’re not logical; we’re emotional, motivated by pride and vanity. Rather than condemn others, try to understand them. Try to figure out why they do what they do. We all want to be appreciated. Encourage others to talk about themselves. Always make the others feel important. Most people you meet will feel superior to you in some way. A sure way to their hearts is to let them realize in some subtle way that you recognize their importance, and recognize it sincerely. When you’re right, try to win people gently and tactfully to your way of thinking. When you’re wrong, admit your mistakes quickly and with enthusiasm. It’s always easier to listen to unpleasant things after we have heard some praise of our good points. The beauty of this approach is that the site doesn’t ever appear broken and the user won’t even be aware that they are getting the ‘default’ experience. 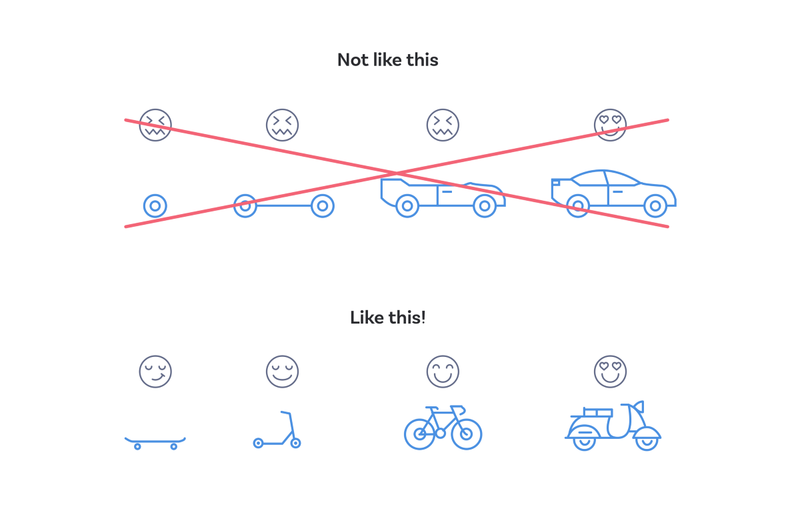 With progressive enhancement, every user has their own experience of the site, rather than an experience that the designers and developers demand of them. method: "POST", // *GET, POST, PUT, DELETE, etc. I could only go so long, on a blog devoted to books about self-improvement and personal effectiveness, without covering the quintessential modern tome on the subject. The 7 Habits of Highly Effective People has become so representative of increasing personal effectiveness that it has almost become a cliché, even to the point where it is derided as representative of the inauthenticity and shallowness of many who claim to practice it. I found myself oddly embarrassed to be seen reading this book on the subway – lest someone attribute that same character to me. In truth, this book is more worthy of its acclaim than of its infamy. If you can push past the Buzzfeed-style clickbait titles to understand the truths behind them that were the impetus for people to later turn them into buzzwords, you will find enormous value in these pages. In the pursuit of personal effectiveness, most people try to change one of two things: their behavior (“I’m going to try really hard at this!”) or their attitude (hence the popularity of self-help books and motivational speakers). If you’ve tried these approaches, you know them to be ineffective. The only solution for real change is the recognition and changing of your personal “paradigm,” or pattern of perception by which you view the world. To sum up the seven habits at a high level, an effective person has learned to make the paradigm shift from outside-in to inside-out, progressing along the growth continuum from dependence to independence to interdependence. He has found the balance of being able to produce while also increasing his capacity to further produce. That may sound like a bunch of gobbledygook, but it will become clear as you progress through the habits and make the paradigm shift the author writes about. The first three habits are habits of self-mastery, or private victories. These habits must come first, after which come the second three habits of public victories. The last habit is one that is key to the proper functioning and renewal of the first six. Put aside the dictionary definition of the word “proactive” for a moment, as well as any meaning you’ve learned to attribute to it from your time in the workforce. You’ll have to do this with several of the upcoming habit titles in order to understand what Covey is saying. The author defines proactivity (and the paradigm shift that comes with it) as exercising your freedom to choose self-awareness, imagination, conscience, or independent will in between stimulus and response. If you’re unhappy, unsuccessful, etc., it’s because you chose to let something make you that way instead of choosing your own response. This is not to minimize the effect that genetics, upbringing, or environment have on who a person is; however, being an effective person requires that you recognize your responsibility to shape your response to those things. This is not just positive thinking; being proactive means understanding the reality of a situation, but understanding the reality of a situation also means understanding the reality that you can choose your response to your circumstance. We all have a “circle of concern,” representing all the things that we care about. We can only influence a small portion of the things in our circle of concern, and many people spend their time and energy worrying or complaining about the things they can’t control. The more you focus on things outside your control, i.e. 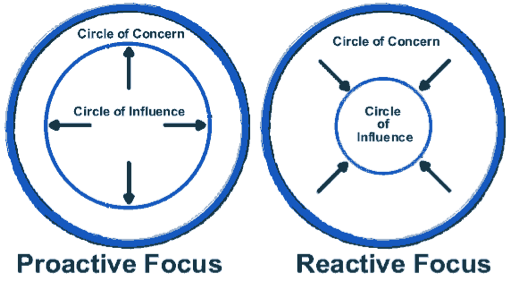 outside your “circle of influence,” the fewer things you’ll be able to control. Your circle of influence will shrink. In contrast, by focusing only on those things within your control, you will find that your circle of influence will grow. To shift your focus to your circle of influence, stop saying the “haves” (if I only had a better job) and start saying the “be’s” (I can be more _). Said another way, Habit 1 is “You are the creator.” Habit 2 is the first creation. Beginning with the end in mind means approaching any role you have in life with your values and directions clear. Because we are self-aware, we can realize when we are acting in a role that isn’t in harmony with our values or isn’t a result of our own proactive design. Whatever is at the center of your life will be the source of your security (your sense of worth), guidance (your source of direction in life), wisdom (your perspective on life), and power (your capacity to act and accomplish). Most people never take the time to align their values with their center. As a result, they have one or more of many possible alternative centers. People can be spouse centered, family centered, money centered, work centered, pleasure centered, friend or enemy centered, church centered, or self centered. You probably know someone who is an example of being centered around each one of these things, and if you’re honest with yourself, you’ll realize that there are probably times when you become centered around many of these things as well. Many of these things are perfectly good in and of themselves, but it isn’t healthy for your security, guidance, wisdom, or power to depend on and be determined by any of them. Instead, to be an effective person we need to have a “principle” center – one that is based on timeless, unchanging values. The principle center will put all these other centers in perspective. The best way to make sure your life is aligned with your principles (and the best way to track when you get off center) is to write a personal mission statement. Covey doesn’t present a cookie-cutter formula for doing so, but suggests approaching it from the perspective of roles and goals: who do you want to be, and what do you want to accomplish? This principle is the same for families or organizations; as hokey as it might sound, an authentic mission statement is the first step in the process of being effective. You need to put in the time, thought, and effort in order to gain the right perspective, and in order to set yourself up for the next habit. Effective management means putting first things first, and doing the things that other people don’t want to do. From Habits 1 and 2, you must have a burning “yes” inside you that allows you to say “no” to other things that don’t align with your principles and goals. Notes and checklists (reducing your cognitive burden in the present). Calendars and appointment books (looking ahead to better arrange your future time). Daily planning, by means of goal-setting and prioritization. Most people never get beyond this level. Categorization of activities and purposeful focus on and/or exclusion of certain ones. An effective time manager spends as much time as possible in quadrant II, doing things that are important before they become urgent: building relationships, long-term planning, preventative maintenance of all types, etc. The more time you spend in this quadrant, the less time you will have to spend in quadrant I. Delegate or otherwise cut out anything in quadrant III or IV. 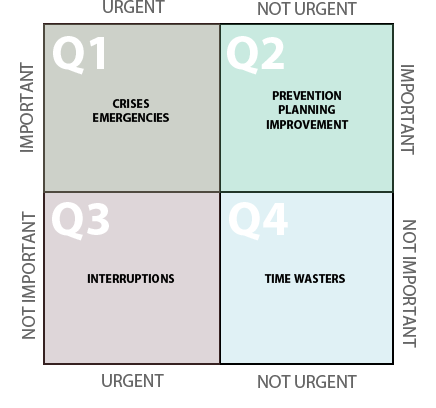 In contrast, most people spend the majority of their time in quadrant I and III, doing urgent things that may or may not be important, and rarely allow you to be effective. Most of us try to get out of this vicious cycle by trying to be more disciplined; however, the author contends that your problem is probably not that you lack discipline. More likely, it is simply that your priorities have not been rooted in your values. 1) Identifying roles. Write down a list of roles that you wish to devote time and energy to filling. Some examples are your role as an individual (for which you would devote time for self-improvement), your role as a family member (spouse, son, mother, etc. ), and your role at work (which may be multiple things, any of which may not correspond to your official title). 2) Selecting goals. Write down one or two goals for each role that you want to accomplish over the next week. Since you’ve already gone through the process of establishing Habits 1 and 2, these goals should be tied into your larger purpose and long-term goals. 3) Scheduling. Take things a step beyond where most people get with their use of scheduling, sit down and plan out your schedule a week at a time. This allows you to match your goals with the best time to accomplish them. For example, peak productivity for most people is between 2 – 5 hours after waking. One use of this principle might be to schedule time 2 – 5 hours after waking on Saturday to do the most important quadrant II activities that your job won’t allow you to do during the week. The key is not prioritize your schedule, but schedule your priorities. 4) Daily adapting. Take a few minutes at the beginning of each day to review the schedule you put together and revisit the values that induced you to establish your goals for the day. In real life, things change, so it is important to allow your schedule to be fluid and adaptable while keeping your focus on your values and priorities. Try thinking about your relationships as an emotional bank account. By proactively making deposits, you ensure that the emotional funds will be there when the time comes to make a withdrawal. Win/win is often difficult, but is made much easier by the presence of a hefty emotional bank account. You can find a more thorough presentation of this approach to effective negotiations in Getting to Yes by Roger Fisher and William Ury . The essence of Getting to Yes is to separate the person from the problem, focus on interests instead of positions, invent options for mutual gain, and insist on objective criteria. The key to this chapter is that in most difficult situations, the problem is the system, not the people. By approaching those situations with the question of how we can change the system in order to make it work for all involved, many difficult problems can be resolved. If you want to interact effectively with people and influence them, you must first understand them. It may be common sense, but it stands in direct contrast to most people’s modus operandi, which is to be first concerned with being understood. The first three are self-explanatory, but you may not have heard the term “empathic listening” before. Empathic listening means getting inside someone else’s frame of reference by “listening” to their body language, tone, expression, and feelings. It’s a tremendous deposit in the emotional bank account. By listening empathically instead of forcing our natural autobiographical responses onto each situation, we can get beyond a surface-level, transactional exchange and have a real impact. Needs stop motivating people once those needs are satisfied. Satisfy the need to be understood, and you can move on to being productive. The other half of this habit, then, is being understood. Covey refers to the Greek philosophy of ethos, pathos, logos – first character, then relationships, and only afterward the logic of what you’re saying. Most people try to skip straight to logos in every exchange, but it can’t be denied that someone must first trust you and understand where you’re coming from emotionally before they will understand how your logic fits into the overall picture of your perspective. Approach your communication through this framework, and you’ll be surprised at how much more easily you get your point across. This habit is powerful because it is always in your circle of influence to seek first to understand, then to be understood. When people understand each other, the door is opened for third alternatives – win/win solutions. Despite being entitled with the business world’s most eminently cringeworthy king of buzzwords, this chapter offers enormous value if you can grasp the principle. Covey is not referring here to the type of “synergy” that occurs when two companies merge and become better together by cutting down on administration costs. He’s not even referring only to the simple act of working together to accomplish more than what you could accomplish on your own. What the author means by synergy is something that may be impossible to understand unless you have experienced it. One way to describe it is when a group of people enter a simultaneous and cooperative state of flow – the “peak experience” of group interaction. You may have had an experience playing sports where the team just gelled and the plays started clicking like you were moving as one body. Perhaps you’ve played in a musical group and found yourselves in a song where every note was perfect, every hook was tight, and you found yourself improvising riffs you didn’t even know you were capable of playing. You might have been in an emergency situation where a group of strangers came together to act with a degree of cooperation that seemed unprecedented. Maybe you’ve had one of those conversations with a group of close friends where you were baring your souls about some deep, commonly held belief or commonly faced challenge, and each person’s words created thoughts in your own mind that you then perfectly expressed as insights you didn’t even know you had. This is what the author means by synergy – a shared peak experience that can be created as the culmination of the first five habits. The key here is that synergy of this type doesn’t have to be a rare experience. We can create it in our everyday lives, beginning to live at a higher level by putting the first five habits into practice and adding a courageous amount of authenticity and openness. To be able to consistently operate at this level is to achieve the ability to be more effective than most people can even dream of being. Remember, these are all intended to be habits, which means they have to be practiced repeatedly. In order to be able to practice these things, you need to take the time to renew yourself. When you neglect any one area, you damage the rest – so commit at least one hour of every day to these practices. Covey doesn’t spend enough time on any of these things to be the best “how-to” source for their implementation, and I don’t think that was his intention. His point is that an overall balance is necessary to support the other six habits. If done correctly, it leads to a virtuous cycle of continual personal growth. In a twist of cruel irony, it seems that the 7 Habits of Highly Effective People has become the poster child for the very things it was written to help people overcome. The crux of the book is that to be effective, you must come from a place of authenticity, starting with your values and building with each successive habit. Unfortunately, it is human nature to imitate the form without delivering the authenticity. The value of this book made it the victim of its own success when it was catapulted into becoming the business world’s favorite trend for a time. It seems that many people and organizations genuinely liked what they heard, but then tried to awkwardly force the habits onto their own lives or others’ (often cherrypicking the ones that sounded easier) without truly taking them to heart. An unlikely alliance of Covey-directed scorn was resulted between those who have had negative interactions with such people, and the small minds who couldn’t overcome their own scripts in order to understand Habit 1 and take responsibility for the results of their lives. The disdain is truly undeserved. In reading the book, titles that at first reek of buzzword become epiphanies once you understand the truth of the principle. Reducing this particular book to a quick summary, which certainly has its uses, also has the effect of losing some of the meaning – of taking some powerful, emotion-filled lessons and reducing it to bullet points. While it is certainly not a comprehensive framework for personal effectiveness, The 7 Habits of Highly Effective People gets many things right, and deserves its spot as the manifesto of personal effectiveness. One thing this book is missing is the practical technique for managing the human mind to put new habits into practice. For that skill, refer to The Power of Habit by Charles Duhigg . 1. Be proactive. Adopt a perspective of responsibility for your actions, reactions, and results. 2. Begin with the end in mind. Make sure your efforts start with establishment of your personal principles. 3. Put first things first. Spend your time on things that are important, not on things that are urgent. 4. Think Win/Win. Approach every interaction with the perspective of trying to fix the system, not the person, in order to find the solution that is best for all involved. 5. Seek First to Understand, Then to Be Understood. Meet people’s need to be understood, establish trust, and communicate your emotions; communicate your logic last. 6. Synergize. Combine the first five habits for an exponentially higher level of effective and cooperative daily interaction. 7. Sharpen the Saw. Take the time to maintain and renew your mind, body, emotions, and spirit.